Seville Cathedral is the largest Gothic cathedral in the world. It is the third largest church in the world, only smaller than St. Peter’s Basilica in Vatican City and the basilica in Aparecida, Brazil. Seville cathedral was completed in the early 16th century, and its considerable size was meant to showcase the city’s wealth and stature (why else would you build a grand cathedral?). The cathedral is the final resting place for many important people in Spanish history, most notably Christopher Columbus. In total, the cathedral holds 80 chapels, each with its own ornate decorations, and the main altarpiece was the life’s work of the artist Pierre Dancart. The level of detail seen throughout the cathedral is very impressive. Wherever you look — doors, walls, ceilings, floors — intricate patterns and designs can be found. It is also interesting to observe the Islamic influences of the region that were carried over in the cathedral’s construction. The Giralda, the bell tower of the cathedral, was originally part of a mosque that occupied the same location. The orange trees in the cathedral’s courtyard are another sign of the area’s Islamic past. In addition to the architectural details, the cathedral houses an impressive collection of statues, paintings and other priceless treasures. Look no further than the cathedral’s treasury if you are in the mood to pull off an elaborate heist. Maria Luisa Park is the primary park in Seville, encompassing 100 acres of land along the Guadalquivir River. Some of the main tourist activities include taking a carriage ride, exploring the park’s museums, and visiting the fountains, pavilions and ponds. 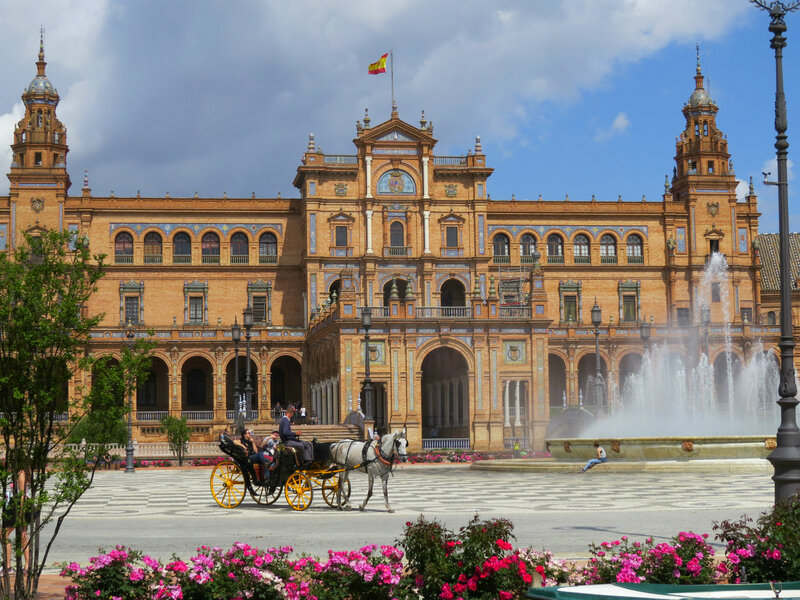 The impressive Plaza de España is also located within the park. The plaza was built for an exposition in the early 1900s and has served as a set location for movies, such as the godawful Star Wars prequels. Plaza de Toros (officially Plaza de toros de la Real Maestranza de Caballeria de Sevilla) is the primary bull fighting ring in Seville and one of the most famous and popular bull fighting sites in the world. The ring dates back to the mid-1700s, and bull fights are typically held from April to September, except during the hottest part of the summer. On days when an event is not scheduled, guests can tour the ring.